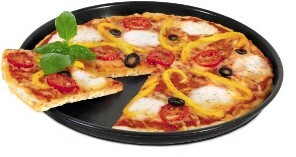 Active pizza tray for all appliances with microwave and fan-assisted functionality. It has a heat-storing active coating for crispy pizza bases. It preheats the pizza tray using microwave then bakes by using the combi function: this way deep-frozen pizzas or freshly made bases will become really crispy!